Superhero and Manga comics may be the popular entertainment of today. In the 16th century, where illiteracy was still rife, the printing industry was turning out illustrated books to complement printed texts. The Norris Museum in St Ives, Huntingdonshire, UK holds two such books from this period. This article is about “Biblische Figuren des Alten Testaments / Biblische Figuren des Neuwen Testaments” (Biblical pictures from the old Testament/Biblical pictures from the new Testament), by Virgil Solis, 1562. Norris Museum catalogue entries 89/201. I had the privilege of photographing the entire book and making it available online. This was, in its way, a thoroughly modern interpretation of the Bible for its time. The figures in the beautifully illustrated woodcuts are all dressed in contemporary 16th century costume, from farmers and maids to soldiers, merchants and ladies. Apart from Adam and Eve in the Garden of Eden, of course! Rather than being just flat images, these woodcuts have perspective. There is the main action in the foreground and then you’re eye is led to see what is beyond that, often leading you further into a magical world. Initially the picture seems to be all in one, a large central image surrounded by detailed carved frames. However, as you wonder through the book page by page, you notice some repetition in the frames. This would suggest that the central panels and the frames were separate elements within the printing process. The frames themselves also vary quite widely in detail and content. In some I particularly enjoyed the depictions of animals and in another, insects. Add caFrames are separate from the central panel. This one is rich in insects! The author of the book, Virgil Solis, was a renowned artist, well-known for his woodcuts. It’s not clear whether he was born in Nuremberg or came there from Zurich at a young age. His work initially consisted of direct copies, for example of Holbein in the 1530s. He continued to use the work of other artists of his age as a template, but became freer in his interpretation and style. Apart from the incineration Bible of 1531, it wasn’t till the 1550s that we see book illustrations with his work come to the fore, in his so-called Nuremberg period. The most important part of his life from our point of view, it is his association with the publisher printer Sigmund Feyerabend. Solis’s contribution to the 1560 Bible cemented both their reputations. This version contained 74 illustrations without frames and dealt with the old Testament. The 1561 illustrated Bible broadly contained the same illustrations as the 1560 but the text version also expanded into the new Testament. Here the illustrations were surrounded by frames. 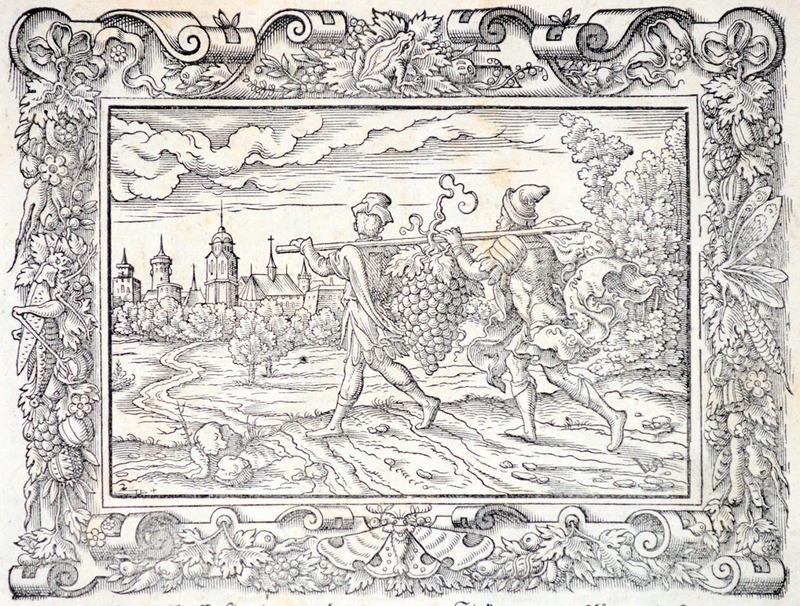 Sigmund Feyerabend obviously decided to capitalise on the success of the early Bibles to produce an extended illustrated edition in 1562, and it is one of these copies in the Norris Museum. Here, the number of illustrations by Virgil Solis was expanded and they were printed surrounded by a variety of 31 different frames. This illustrated Bible would act as the template for future editions and also derivatives by other artists. We don’t really know very much at all about Virgil Solis. Even the date of his death, 1562, is possibly open to debate. 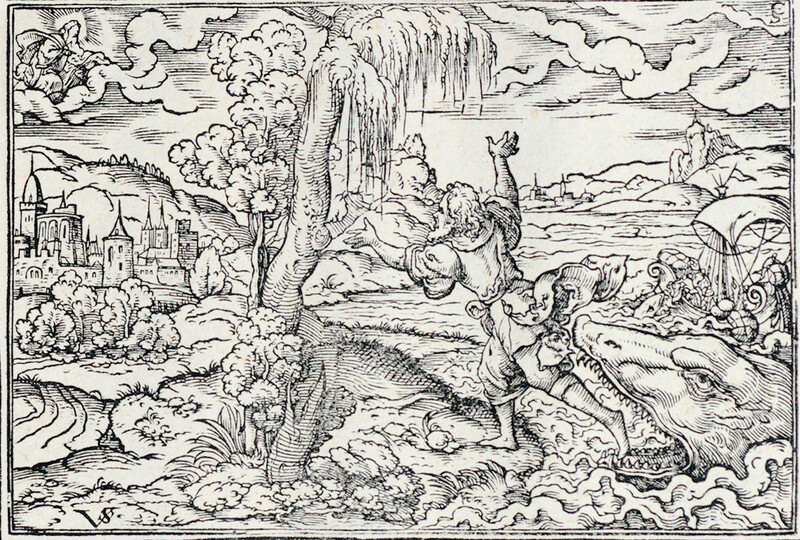 But he left a legacy of woodcuts that would be used for printing books through into the 17th century. If you have some time, sit down and gently leaf through the “Biblische Figuren des Alten Testaments / Biblische Figuren des Neuwen Testaments” and simply enjoy the beauty, variety and storytelling in these wonderful woodcuts by Virgil Solis. This book is now available online for you to read in your own home or place of work at the Internet archive, https://archive.org/details/VirgilSolisBible1562. Don't wait 450 years, you can ask me to tell your interesting stories now! Information on Virgil Solis and his Bible illustrations was extracted from another book, also on the Internet archive; “Virgil Solis und seine biblischen Illustrationen für den Holzschnitt (1889)” by E von Ubisch: https://archive.org/details/virgilsolisunds00ubisgoog. Book digitized by Google from the library of Harvard University and uploaded to the Internet Archive by user tpb.